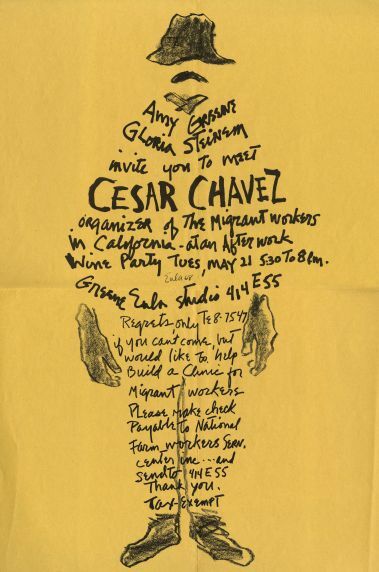 Poster details a gathering, described as an “after work wine party,” held by Amy Greene and Gloria Steinem for those wanting to meet Cesar Chavez. The party, to be held at at the Greene Eala Studio, is a fundraiser to build a health clinic for migrant workers. Image depicts a hat, moustache, collar, hands, and feet of a man with the poster’s text forming the rest of the body.